I have not been active on this board at all. My sincere apologies. I have no excuses. I've been very very busy. I will try to be more active shortly, and will start first with responding to your posts here. At http://www.HamzeiAnalytics.com, we run TradeStation v8.0 Build 1869. Unfortunately, our Analysis Techniques and Strategies are no longer compatible with TS v4.0 or TS v2000i. We are very sorry that we could NOT provide a number of you with the EL codes compatible with the older versions. call us and we'll have someone walk you thru. In the very near future we will be sending out a how-to article for CI and DCI usage. However, because of the overwhelming demand for information about these indicators, we will mass email our article to those persons who are on the opt-in list. Please make sure you are on our free opt-in list for this and other actionable/tradeable information, i.e., Market Sentiment Alerts (click here www.HamzeiAnalytics.com). You can always opt-out at your convenience. In the very near future, we will be sending out a how-to article on construction and usage of CI and DCI indicators. However, because of the overwhelming demand for information about these indicators, the most efficient method to connect with everyone is to mass email the info to the people on our opt-in list. Please make sure you are on our free opt-in list for this and other actionable/tradeable information, i.e., Market Sentiment Alerts (click here http://www.HamzeiAnalytics.com). You can always opt-out at your convenience. Very nice Fari, Thank you. Looking forward to the construction article of your derivatives of Blau's indicators. Please give us your feedback by voting on this thread. BTW the timebomb on the new code is extenced to November 30th, 2004. I am invited by CBOE / Options Institute to give a talk in San Francisco on November 10th. Subject is Hedged Sector Funds using EFTs. What does this recent post (10/26/2004 17:48:47) mean in english? "BTW the timebomb on the new code is extenced to November 30th, 2004." I'm sorry that I am computer illiterate. since we post the write-up later than originally planned, we felt compelled to extended the last usage date of the encrypted TS code from Oct 31 to Nov 30. After December 1, you have to contact us to lease the indicators on a monthly basis. we did the same thing for eSignal users. We found one of the charts (first DCI) in our PDF file looked kinda strange...upon further investigation, we found an error in the plot sequence (in that chart only). As i mentioned the error was in the PDF's **chart** not in the ELD. I reverified and uploaded the ELD files again just in case. http://www.hamzeianalytics.com/EL/CI_DCI_4_TSW.ELD ....i downloaded this again and got the new eld....but it still shows up as not verified....could it be i am missing the indicator name.....what should it show as... DCI....CI ( its says verified as it downloads...so is it under another name? send us an email and we will email it to you. A number of you had a problem when importing our CI & DCI indicators into your Version 8.0 Build 1869 TS. TradeStation would tag the indicators and/or functions as "NOT VERIFIED", even though, they left here verified on our development PCs. We looked into this each time we received an email but could not recreate the problem on our development PCs. Yesterday, we issued fully functional codes for CI & DCI Subscribers. Again the same problem resurfaced. 1) I set up fresh new XP Pro with TS v8 B1869 on it. 2) During the testing I found out that I had to delete all the previous components of these two indicators in TS Library (functions and indicators). Somehow it seems that the Overwrite Command is not functioning consistently. 2) On my development PC, I hade to reverify each component from INSIDE OUT, that is VERIFY the FUNCTIONS first and then VERIFY the INDICATORS. It worked, after three (3) hours of deleting, verifying, uploading and emailing. This morning, I have reported this problem to Peter Parandjuk, CTO of TradeStation. Peter IS A GOOD GUY and WORKS HARD. He will get this issue fixed over there. In the meantime, I am terribly sorry for those of you who could take advantage of our free trial period. If you had experienced the so-called "NOT VERIFIED" problem, simply forward us any correnspondence you had with us, along with your TradeStation Customer Number and we will get you a 30-day free trial to CI and DCI Indicators. Remember this code is for V8 B1869 only. We must hear from you before December 12th. also, I had to split the two indicators into two separate ELD packs before they worked. The idea for the Directional Volatility was first presented at a http://www.OUGA.com meeting by my long time friend and former TradeStation Solution Providers Tech Advisor, Miles Dunbar. I coded it and played around with it a bit, before offering to our Diamonds Users last summer. Here it is offered to you Free of Charge till February 1st, 2005. Consider it as your Xmas Gift from HA. A how-to pdf document will be posted shortly. We all know that prices have cycles but did you know that volatility has cycles too ? What DV does here is to identity when the volatility has collapsed and thus the next big volatile day is coming. Look for low levels of red curve... they usually precede a big day in the asset you are following. DO NOT USE LESS THAN DAILY DATA COMPRESSION, as interday volatility is not a mystery, it is an "U" -- that it is highest at the Open and the Close. That fact we know. The best days for intraday trading are the big directional trades, that is buy the open and sell the close, in case of up move, or vice versa, sell the open and buy the close, in case of a down move. Keep in mind DV will NOT tell you the direction of prices, only the odds of volatility expansion. You need a good momentum/trend indicator (like CI) to detect that. As matter of fact, the combo of CI and DV indicators have shown an unccanny ability to give us a heads up for a potential upcoming big day and its direction. 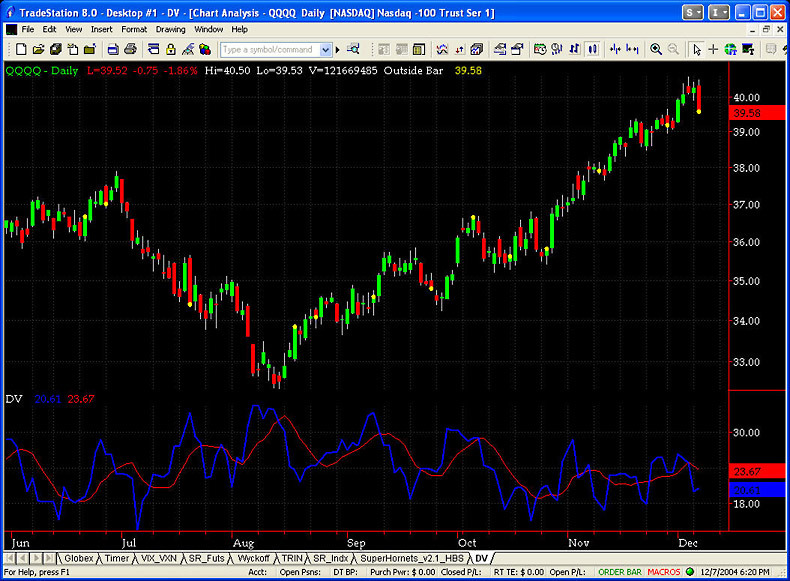 Look for the low reading of BLUE curve in the DV Indicator. The color red was mentioned by error. We had a number of emails regarding the DV indicator already. Thanks for your participation and keep them coming !! The DV Indicator is an excellent addition to you daytrading toolbox. It forewarns you of an upcoming long bar day for the asset to seek to daytrade. Typically, as a daytrader, you are looking for a day that opens at the high or the low and closes at low or the high of that day. If you can harvest 70% plus of that move, you do well daytrading the markets. This indicator tries to pinpoint those opportunitiies for you. Look for a low reading of the BLUE curve. The big bar day is coming up in a day or two. This indicator WILL NOT TELL YOU THE DIRECTION. THAT YOU CAN ASCERTAIN FROM A ZERO-LAG MOMENTUM/TREND INDICATOR such as our CI Indicator. This page was generated in 1.15 seconds. 2003-2019 TradeStation.com.